Exactly one year ago to this day, I found out that I was pregnant with Nino. Of course we didn’t yet know exactly who that poppy seed-sized embryo inside me would turn out to be, but we were pretty sure he (yes he, somehow we knew from the start he’d be a boy) was going to change our lives. I still get goosebumps when I think about seeing those two blue lines for the very first time, Luke’s face when I crept back to the bedroom to tell him the news, his giant beam behind a pair of very bleary eyes . . .
Why the bleary eyes? The night before we’d been at my book launch – where prosecco flowed like it might at a mini wedding – which means today is also one year and one day since Homemade Memories hit the shelves. Publishing a cookbook is a little like having a baby in the beginning. There’s the initial excitement followed by months of eager anticipation as you eat and wait and gain weight. Then there’s the day when this precious thing you’ve been working on so hard is released out into the world for others to see and love and judge. But it’s there that the comparison really ends, because while a book is set in stone, a baby changes every single day. On Friday, just short of his four month birthday, Nino let out his first proper laughs. We’ve had toothless grins and the occasional shriek before, but this was full on gummy giggles of ecstasy, punctuated with gurgles and squeals to melt a mother’s heart. 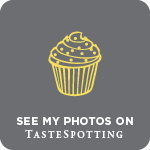 Every day there’s something different and fabulous to take note of and I’m relishing each mini milestone, in awe of how a human baby learns and grows each day. While the pages of a cookbook may be set in stone (ok, ink), that’s not to say the individual recipes are. 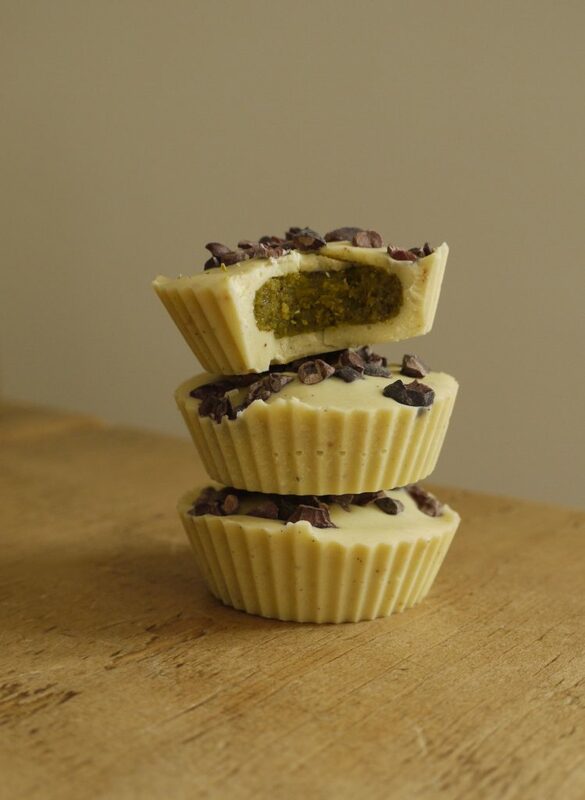 Last year I made a rhubarb and white chocolate version of the Jaffa Orange Cakes in the book, and today the Milk Chocolate Peanut Butter Cups are getting a makeover. When Nino was first born we went through way more boxes of Hotel Chocolat chocolates (kindly gifted by my mother in law) than is strictly healthy and our absolute favourite was the Pistachio Caramel Chocolates. 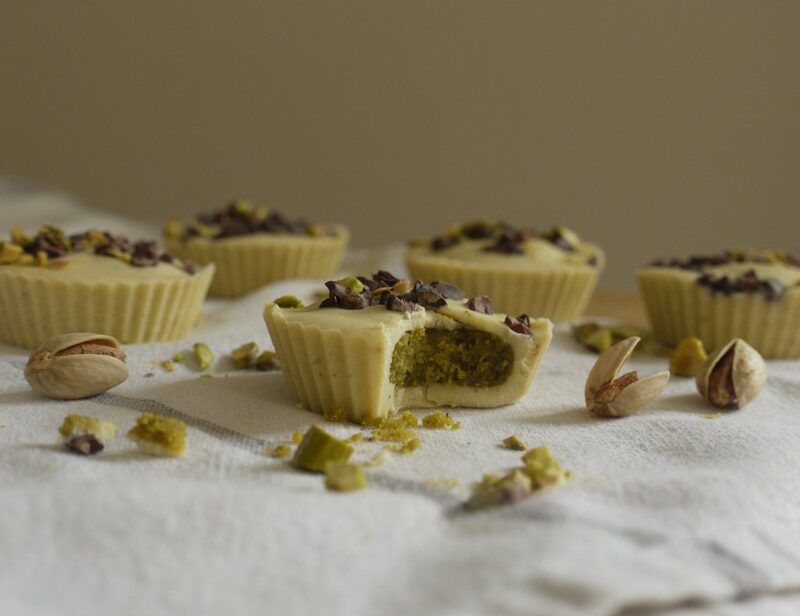 These are a bigger (read greedier) homemade version with a honeyed pistachio paste filling, white chocolate coating and cocoa nibs for crunch. The perfect treats with which to toast a book anniversary and our baby’s first laughs. 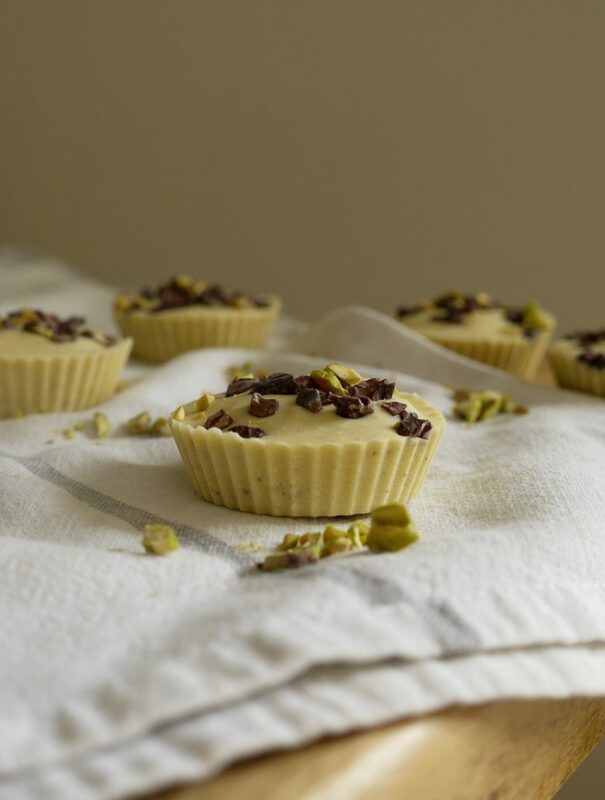 A twist on the classic peanut butter cup, creamy white chocolate enrobes a honeyed pistachio paste filling, topped with cocoa nibs and more pistachios for crunch. 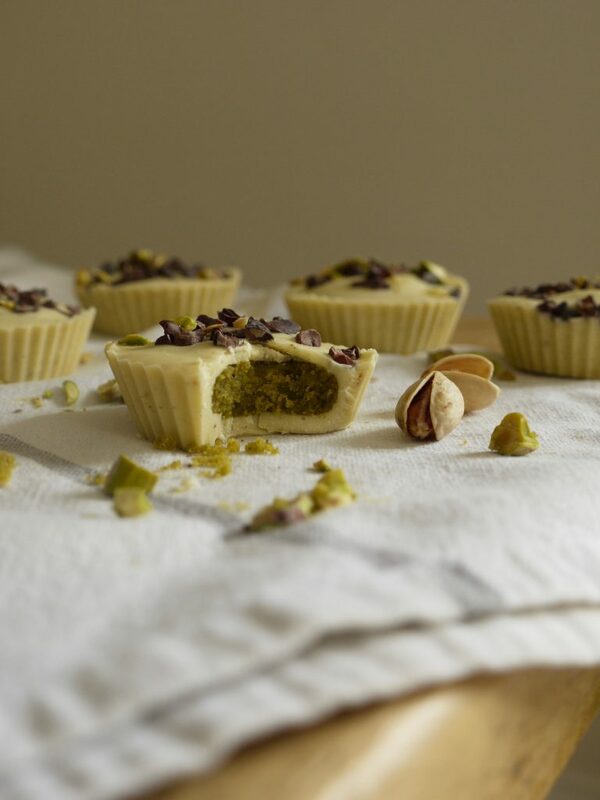 In a high speed blender, blitz the pistachios and oil until smooth. Add the honey, icing sugar, vanilla and salt and blitz until you have a thick paste. You should be able to roll the mixture between your fingers. Roll the paste into 12 equal balls then squash between the palms of your hands to make discs. 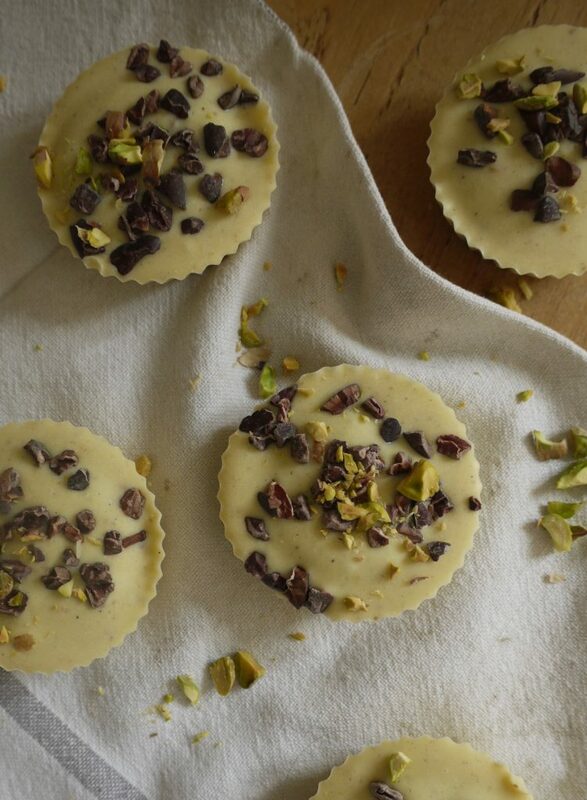 Melt the white chocolate in a bain marie or in the microwave. 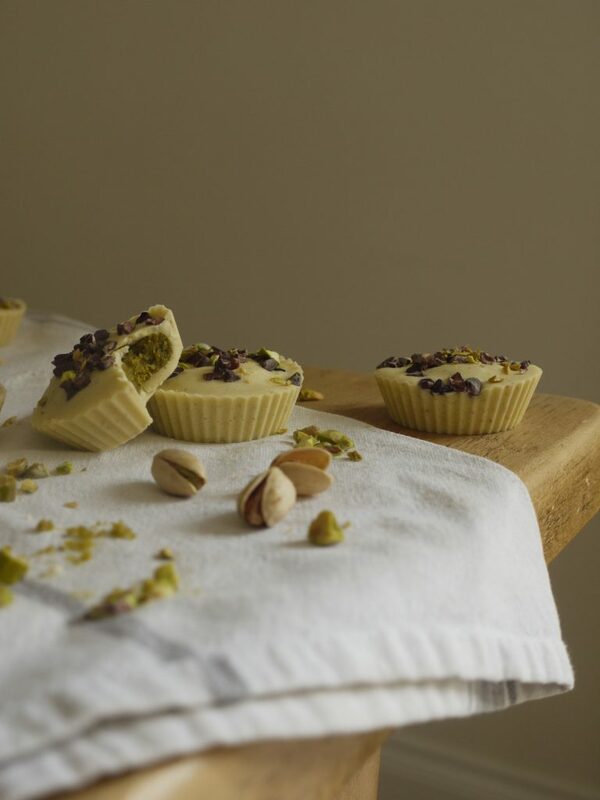 Divide half the mixture between 12 paper or silicone cupcake cases, top each one with a disc of pistachio paste then cover with the remaining melted chocolate. 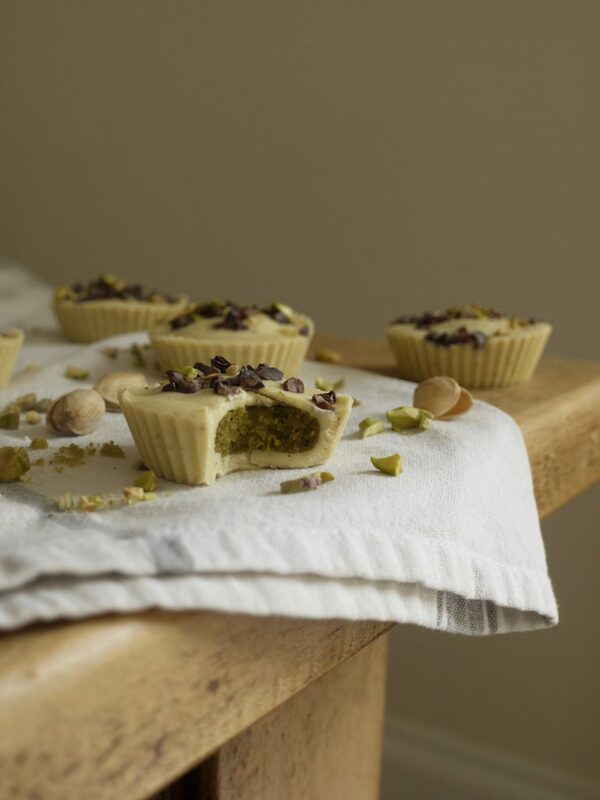 Sprinkle with chopped pistachios and cocoa nibs then pop in the fridge to firm up, around one hour. Will keep in an airtight container for up to two weeks. 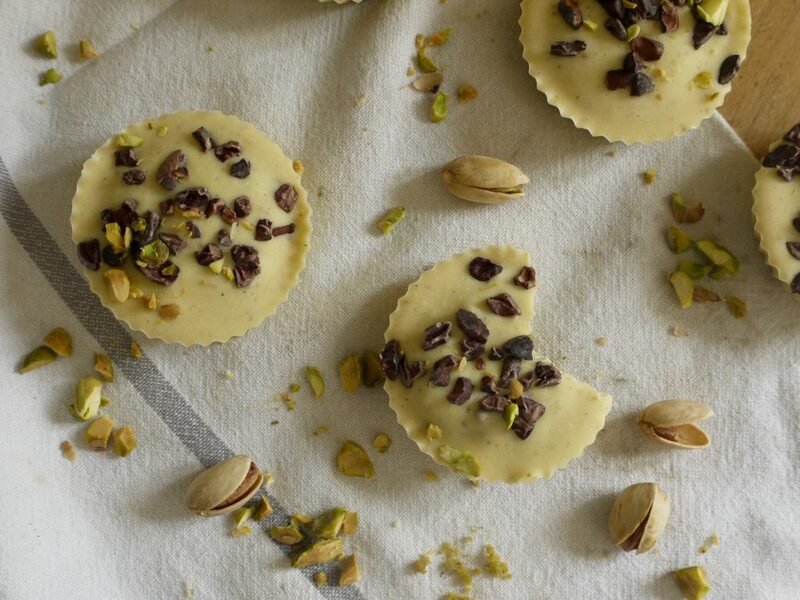 Pistachio and white chocolate are a match made in heaven and these look divinely indulgent! Yay for first laughs! Ahh the first laugh- without doubt the single best noise you’ll have ever heard!